Green Bay Packers QB Aaron Rodgers: "This is an important stretch in our season"
Why is Packers QB Aaron Rodgers so special? What would a 'non-traditional' contract mean for Green Bay Packers QB Aaron Rodgers? Should Aaron Rodgers have more say in the Green Bay Packers' personnel moves? 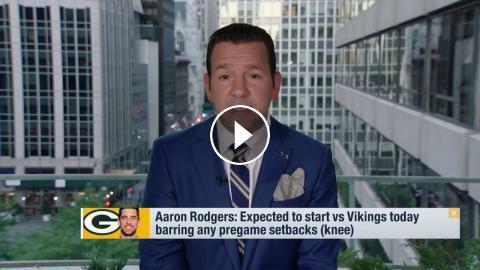 Green Bay Packers QB Aaron Rodgers on win vs. 49ers: "I thought game was going to overtime"
Green Bay Packers QB Aaron Rodgers: "I'd like to be a Packer for life"
How should Green Bay Packers handle QB Aaron Rodgers' knee injury going forward? How concerning is the relationship between the Packers and QB Aaron Rodgers? Green Bay Packers QB Aaron Rodgers on a new contract: "I'm not trying to screw the Packers"